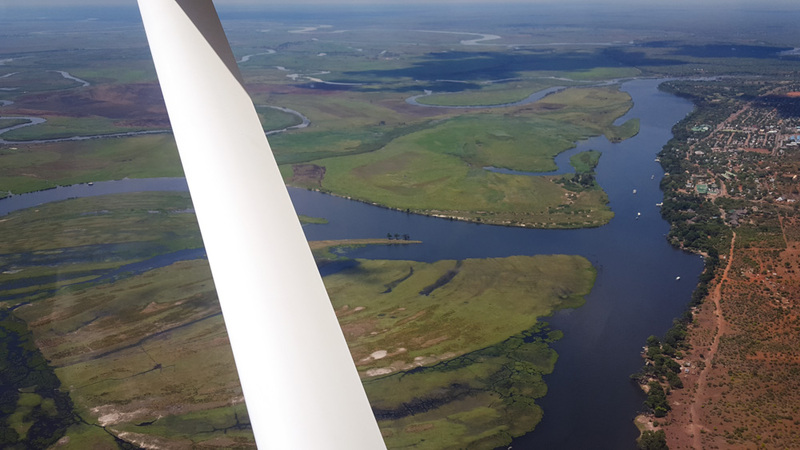 A flight along the great rivers of northern Botswana! 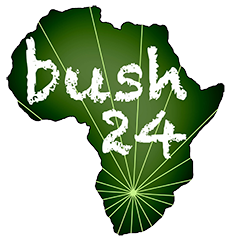 You are here: Homepage > Latest news: > A flight along the great rivers of northern Botswana! What an incredible journey it was flying along the major water courses of northern Botswana as the dry season comes to an end! With thunderstorms brewing we took off from Kasane, gaining height and swinging back to the west, but not before managing to glimpse across at where the Chobe River meets the mighty Zambezi. From there we headed on in the direction of Lake Liambezi before swinging in a bit more “inland”. 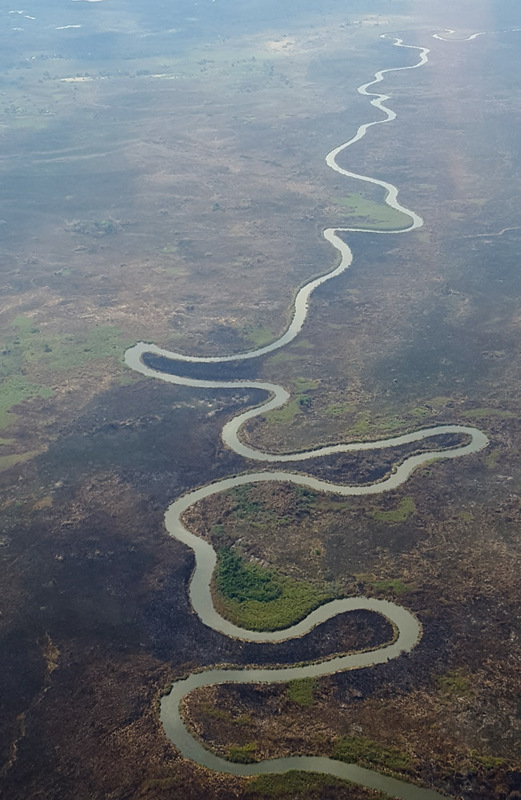 With the Linyanti Swamp as a distant backdrop, we flew on above where the flow of the ephemeral Savuti Channel stopped, almost teasing the wildlife with its unpredictability, but having pushed further east this year. Image 1: looking back east over Chobe Safari lodge and onto Kasane. This is the border of the famous Chobe National Park. 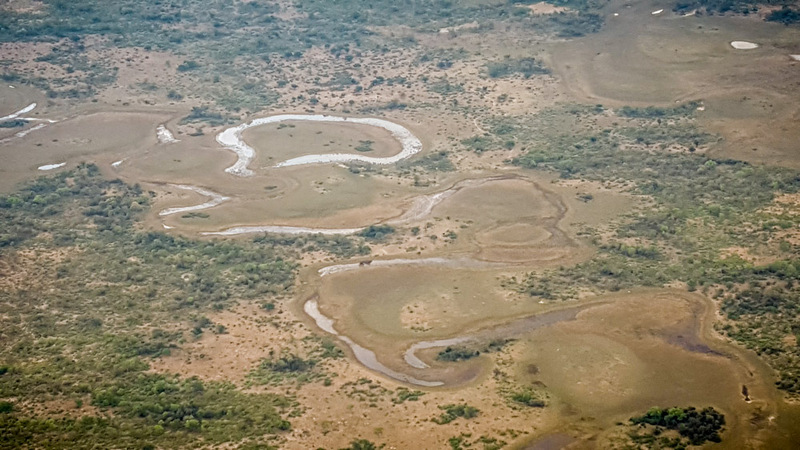 Sedudu Island lies in the foreground of this image – a disputed piece of land that is submerged in the peak flood, it belongs to Botswana but has also been claimed by Namibia until 1999 when in that year it was formally proclaimed Botswana territory. 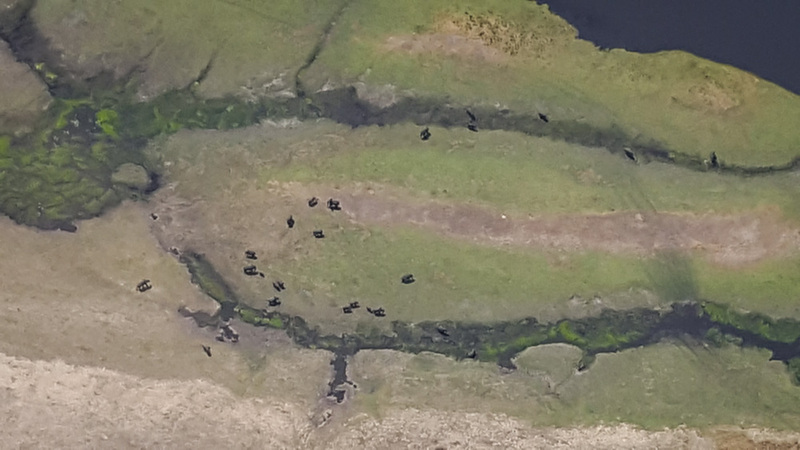 Just like along the Chobe, elephants dotted the remaining water course along the Savuti Channel. Seriously down in number from a few weeks back, it was great to see so few elephants. 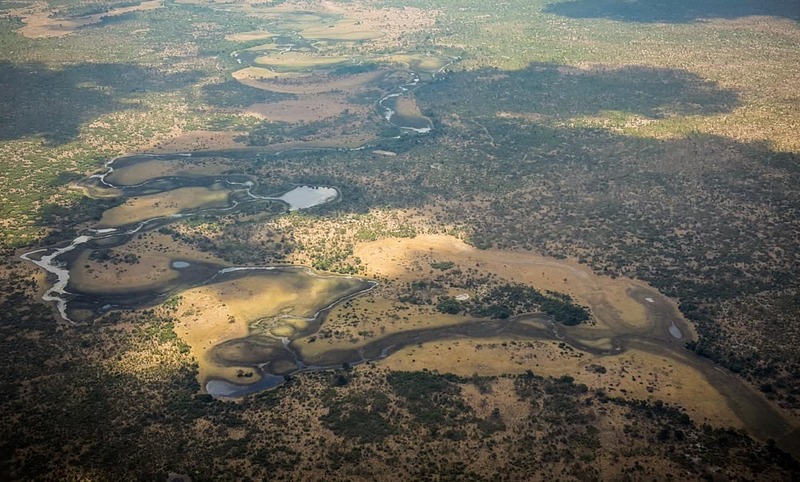 This is because isolated thundershowers have started to fill the pans, allowing not only elephants, but all sorts of wildlife to spread out and have some reprieve since the peak of the dry season, as the search for food can once again take place far from the permanent water courses. 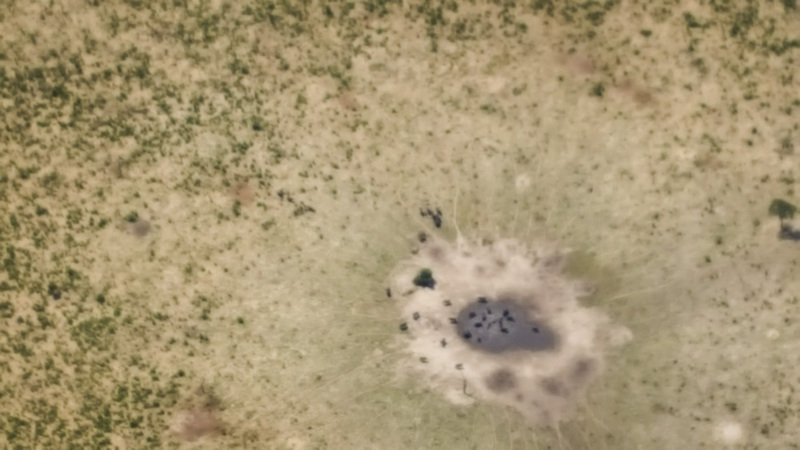 At some 6500 feet up, we could still make out the ant-sized elephants though, also congregating at the occasional rain-filled pan. Far from full, the odd pan here and there bearing water is a good sign from a herbivore point of view! Things are looking promising once again after the severe drought that ended a year back. We do need more rain however and the short-term forecast is looking good for now. Along the Savuti, we continued west to its source, a location on the southern end of the Linyanti Swamp. 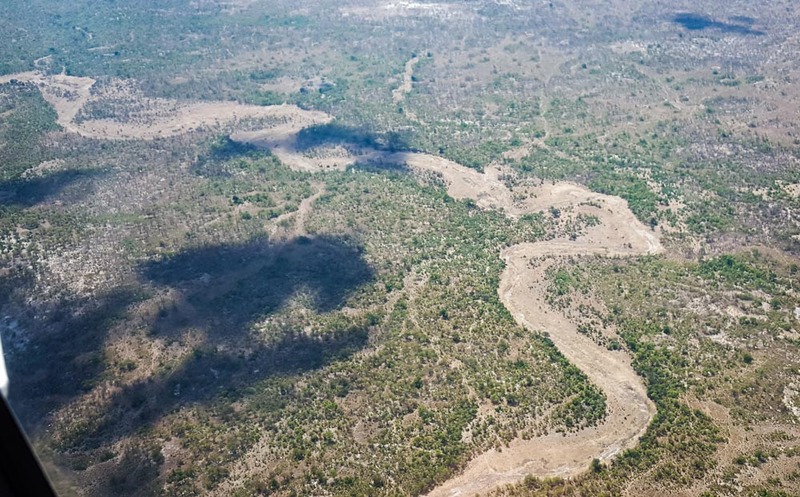 Not far from the point the Selinda Spillway also runs in but varying water levels in the Linyanti and Kavango rivers largely determine the direction in which it flows. However, even though it was not flowing at present, there was still water along most of its course. Heading South West to where the panhandle meets the main body of the Okavango, our visual decreased as the huge numbers of fires of the Okavango caused really bad visibility. We then swung around a storm cell, going in low over thousands of hectares of burnt papyrus beds before eventually touching down on the western edge of the delta. After dropping off a guest we continued back east to Maun, appreciating the vast open plains caused due to the low water levels of this amazing system. Right now, the water tends to be at its lowest and continues to drop if the localized rains are late. Through the haze, Maun lay in sight and a smooth touch down signified the end of an amazing flight!